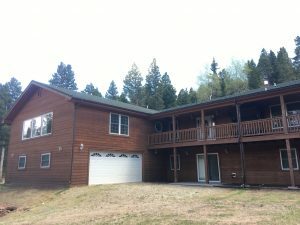 One of a kind Cabin Property located in Costilla County with an indoor Pool! One of a kind Cabin Property located within Costilla County, off old La Vita Pass with a heated indoor endless swimming pool, over 7500sf of living space and on over 40 acres! This is a perfect retirement property or for large families and entertaining! Potential Investment for a B&B or Vacation Rental. Located near Forbes Park, La Veta, Cuchara, Sangre De Cristo Ranches, Fort Garland and Adams State in Alamosa. Just off Hwy 160. This meticulously kept home offers a POOL, Covered patio, large deck and a great layout. Entering this home you will first notice the high ceilings, grand entry and open floorplan. Providing 6 bedrooms, 6 bathrooms, 4 car drive through garage and room for more! There is a main level theater room that could easily be used as an office. The master suite offers an oversized bathroom with jetted tub and two walk in closets! The master suite walks out to the indoor pool. 2 large bedrooms and two full bathrooms complete this side of the home. Main living room over looks the formal dinning room. Offers a built in fireplace and bookshelves and a walkout to the deck or direct access to the indoor pool. The beautifully open kitchen provides plenty of seating at the island or the large eat in area. This kitchen also walks out to the Greenhouse offering a relaxing area for morning coffee. Main level also has a large laundry room that is a great craft room and has a walk out to the enclosed Greenhouse. Finally the familyroom provides a bright open area for everyone to gather. Large picture windows providing the best views. Lower level is a walkout with access to the garage. Large portion of basement could still be finished out to add additional entertainment space or even an additional kitchen or bowling ally! Finally,3 additional bedrooms, 1 full bath!